Find your unique fashion illustration style with Draw Fashion Now! 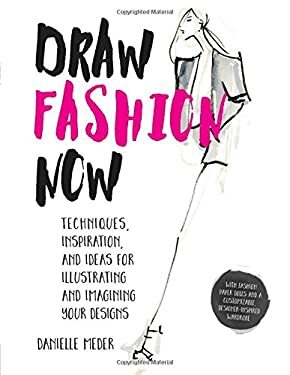 Draw Fashion Now is a combination how-to guide and workbook that teaches the best techniques for illustrating and envisioning 21st-century fashion. Professional fashion illustrator Danielle Meder shares lessons she's learned over fourteen seasons of sketching fashion and style in every fashion capital, offering readers solid illustration techniques that demystify the enigma of fashion ""attitude."" Start by learning the development and rendering process of contemporary male and female figures, each in three essential fashion poses--runway, street style, and red carpet. Then, master basic sketching through rendering garments and fabrics directly on the figure in a range of mediums, both traditional and digital with plenty of blank space throughout to sketch and draw alongside the given examples! Become an expert at ""fashion on the fly"" quick sketches for when inspiration strikes while viewing runway or street style. Two beautiful, sophisticated paper dolls are also included, with contemporary, high-fashion wardrobes by critically acclaimed designers to dress them up! Draw Fashion Now is a uniquely creative and interactive learning experience for fashion illustrators, designers, and enthusiasts at all levels of experience. New (112 available) BRAND NEW. Over 1.5 million happy customers. 100% money-back guarantee. Make your purchase count: support Better World Books' worldwide literacy partners.